Written by a distinguished cast of contributors, Alan Turing: Life and Legacy of a Great Thinker is the definitive collection of essays in commemoration of the 90th birthday of Alan Turing. This fascinating text covers the rich facets of his life, thoughts, and legacy, but also sheds some light on the future of computing science with a chapter contributed by visionary Ray Kurzweil, winner of the 1999 National Medal of Technology. Further, important contributions come from the philosopher Daniel Dennett, the Turing biographer Andrew Hodges, and from the distinguished logician Martin Davis, who provides a first critical essay on an emerging and controversial field termed "hypercomputation." Christof Teuscher holds an electronic engineer degree and received the diploma degree in computer engineering (equivalent to a MSCS degree) from the Swiss Federal Institute of Technology at Lausanne (EPFL) in 2000. Since then, he has been a research and teaching assistant in the Logic Systems Laboratory at EPFL, pursuing the Ph.D. degree in the field of biologically-inspired computing machines. Christof Teuscher's work has been honored with several awards. His first book has been published by Springer-Verlag in 2001: Turing's Connectionism: An Investigation of Neural Network Architectures. He was head of the BioWall project that was widely covered by the media. 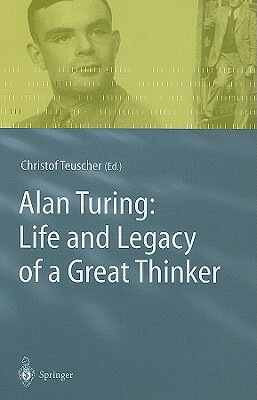 Christof's second book - Alan Turing: Life and Legacy of a Great Thinker - will be published in 2003. Christof has also been nominated for a fellowship at the Center for Advanced Study in the Behavioral Sciences at Stanford University. Christof Teuscher is the initiator and organizer of the Turing Day and an organizer and program chair of the 5th International Workshop on Information Processing in Cells in Tissues, IPCAT2003. He is also a member of the program committee of the 5th International Conference on Evolvable Systems: From Biology to Hardware, ICES'03, of the 7th European Conference on Artificial Life, ECAL2003, and of the NASA/DoD Conference on Evolvable Hardware, EH-2003.